Without a doubt, it was Nature’s aesthetic voice that first drew me to the Bristlecone Pine. That first sight was not in Nature. It was a photograph by famed nature photographer David Muench . David’s image became implanted in my being and has stuck with me ever since. I have no idea why I am so awed by these grotesquely beautiful old trees that can live for 4,000 years in the harshest of conditions. Most certainly, I respect that they have evolved to become incredible survivors who live with few obvious connections to the Nature that surrounds them. Perhaps it is the gnarled beauty of the tree where its scraggly curves and pointed, broken, wildly fractal branches grow out of rock rubble within their harsh environment. These trees are a thing of beauty I cannot explain except when I see them in the context of a different kind of connectivity than I see in other parts of Nature. For a long time, I have simply wanted to engage the Bristlecone Pine’s ecosystem with no plan in mind. Recently, I got my chance. After spending time at the Hoh Rain Forest on Washington’s peninsula , my partner and I went to see the Bristlecone Pines on Wheeler Peak at Great Basin National Park. The contrast between the Hoh Rain Forest and Wheeler Peak is startling. The Hoh Rain Forest, at an altitude ranging from about 400 feet to 2500 feet, is very dense, highly interconnected, with a very rich ground cover. The Wheeler Peak Bristlecones live at an altitude of 10,600 feet (close to the tree line) in a very sparse and seemingly unconnected environment with a ground cover of rock rubble. To be able to engage and photograph these trees has been an unforgettable experience for me. I’m not going to write many facts about the Bristlecone forest because there is a lot of good material available. If facts are what you wish, simply Google “Bristlecone Pine”. However, I do want to share with you some of my images and comment on similarities and differences that I observed between the Hoh Rain Forest and the Bristlecone Pine grove that I visited. In my view, despite the great difference in environments, both forests maintain a similar chain of life. Both places are old growth forests that nurture new life from old life. I mentioned the nursery logs at the Hoh Rain Forest where new seedlings sprout on fallen logs and become colonnades of new trees as the nursery log rots away. At Wheeler Peak, it brought me great joy to see occasional sprouts of new life emerging from Bristlecone wood that has been essentially dead for a very long time. 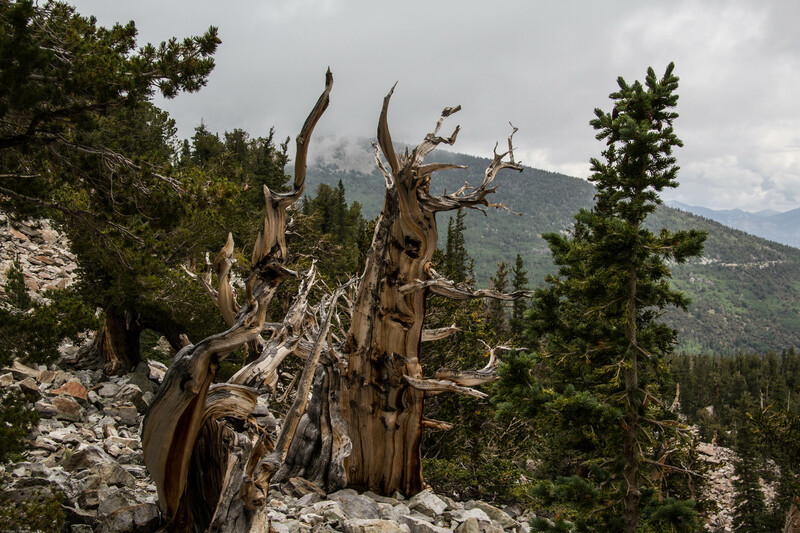 The trunks of many Bristlecone Pines are mostly dead. Yet, there are small spots of life that remain in their wood. These locations give life to new sprouts that become responsible for the long term survival of the tree. In effect, these mostly dead trunks are nursery logs that never rot away. Like the Hoh Ran Forest, new life emerges from the old. The image below shows you these new sprouts on a Bristlecone Pine tree. The Hoh Rain Forest is defined by the huge amount of moss (sometimes called “epiphytes”) that clings to the Bigleaf Maple trees. This moss is commonly called “air plants” because the ephiphyte derives its moisture and nourishment from the air. At the Hoh Rain Forest, the branches of the maple trees actually sprout micro root structures that take nourishment and water from the moss. This means that there is a physical interconnection between the tree and the moss that permits energy to flow. Imagine my delight when I found small patches of moss clinging to the Bristlecone Pines. I have no idea if the moss has the same physical relationship to the tree that has been observed at the Hoh Rain Forest. Whatever the relationship, there is a interconnection of some sort. The density of the Hoh Rain Forest makes it pretty obvious that interdependence between plants is a critical factor in its richness and biodiversity. The Bristlecone Pine forest has none of the Hoh’s thickness and richness. So how does Nature’s primary characteristic of interdependence play a role in the survivability of the Bristlecone Pine? The answer does not lie with the interconnectivity of the Bristlecone Pine with any other species of plant or animals. The answer lies with its interconnection to habitat and climate. 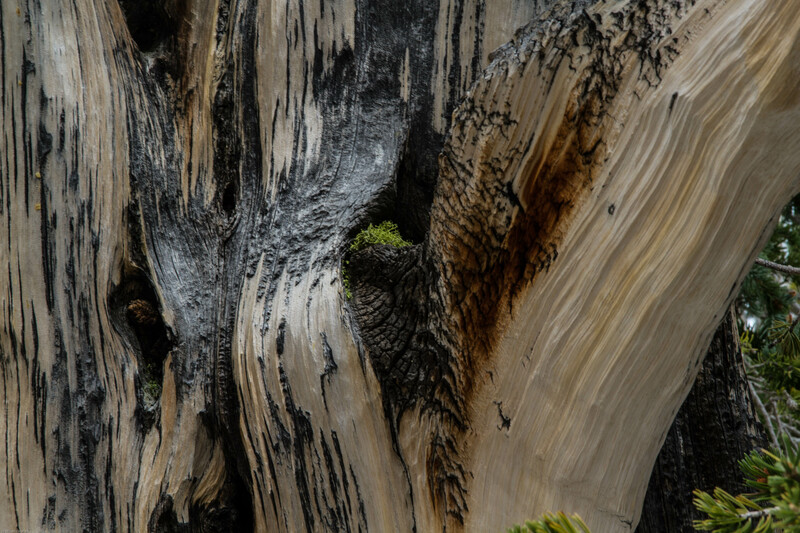 Matthew Salzer , a research associate in the Laboratory of Tree-Ring Research at the University of Arizona in Tucson has studied the Bristlecone Pine and explains how it interconnects with Nature and survives in a seemingly unconnected environment. I paraphrase his work here. The Bristlecone pine is a multi-trunked tree, gnarled and twisted by the elements. Much of the pine is dead wood. As a survival strategy much of the bark and tissue that conduct water dies back after the tree is damaged by fire, drought or storms. This reduces the nutrients the tree has to supply to tissue and balances the result of the damage. The remaining parts are very healthy. A 10 inch strip of bark can sustain a large crown. This bark is red-brown in color and grooved with thick, irregular ridges. Bristlecone pines can survive on the rocky dolomite and alkaline soil layers of its habitat with virtually no rainfall. They are usually a first succession species that tends to occupy new open ground. They generally compete poorly in less-than-harsh environments. Bristlecone pines grow with a lot of space between each tree. They benefit from being off by themselves because few other plant species can survive in their harsh environment. Fires caused by lightning strikes don’t spread far because the spacing of the trees and the lack of ground cover halts the spread flames. A “tree line” is the edge of a habitat, usually a climate boundary defined by altitude, at which trees are capable of growing. Above the altitude of the tree line, most trees cannot tolerate the cold temperatures or lack of moisture. Salzer’s study suggests that global warming is causing the tree line to move to a higher altitude. Because Bristlecone Pine trees at the previous tree line are no longer living in the coldest thermal extreme they can withstand, new Bristlecone Pines are now growing at altitudes above what had been considered the tree line. As the tree line altitude for the Bristlecone Pine growth does rise, these trees would join the ranks of organisms around the world whose habitats have shifted to cooler altitudes and/or latitudes in response to climate change. Pacific Salmon, flowering plants in North America, and algae in the Mediterranean have all been moving farther north to find cooler conditions closer to their former habitats. From this work, it is becoming clear that a key connection in Nature for the Bristlecone Pine is climate. The Bristlecone Pine likes the colder climate at the tree line. 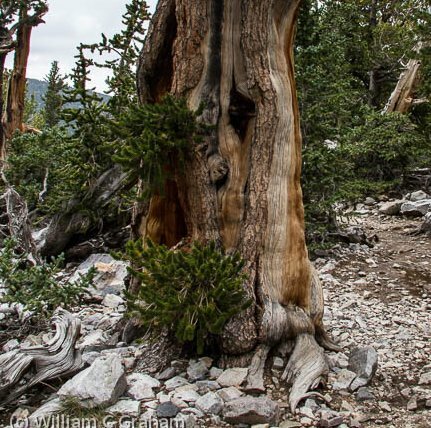 This colder climate keeps other trees away from the Bristlecone Pine’s environment. The result is less competition for scarce resources. Unlike the Hoh Rain Forest, the Bristlecone Pine forest exhibits a sharp contrast between interdependence and independence. In order to survive, the Bristlecone Pine exhibits independence from many other plants. The Hoh Rain Forest is highly interdependent. The Hoh has a very rich biodiversity. The Bristlecone forest depends upon little or no biodiversity. However, it has two key dependencies. First, its unique adaptation to soil conditions that prevent other plants from growing in its territory. Second, the Bristlecone Pine has an affinity to a colder climate than most other plants. These two dependencies define the very being of this strangely beautiful and unique plant. These trees remind me of those I observed in Arctic Village, Alaska, a stop over on the way to the Kongakut River and a rafting trip toward the Arctic Ocean. I wonder if they are related. Thanks. Very interesting work. Great Basin bristlecone pine Pinus longaeva in Utah, Nevada and eastern California. The famous longest-lived species; often the term Bristlecone pine refers to this tree in particular. Rocky Mountains bristlecone pine Pinus aristata in Colorado, New Mexico and Arizona. The most populous species; capable of forming closed canopies and, unlike the other two, is commonly cultivated. Foxtail pine Pinus balfouriana with two disjunct populations found in the Klamath Mountains (subspecies balfouriana) and the southern Sierra Nevada (subspecies austrina). A small outlying population was reported in southern Oregon, but was proven to have been misidentified. Forms the thickest groves of the three. When I do a search for these trees using the word “Alaska”, I get nothing. Were the trees that you saw solitary and in rocky soil? Also, the “tree line” in Northern Alaska is very vague because of the angle of the sun. I’ve been up to Northern Alaska three times and love it !!! Thanks for your reply, Bill. The trees might be a kind of spruce, very stunted because of the poor soil condition and severe weather. However, this may have changed, since I believe the permafrost is melting. My cousin, Bob Dittrick, conducts birding adventures and rafting trips. I will ask him what they are. Wilderness Birding Adventures–We took a family trip the end of July, beginning of August in 2000. I love your blog. It is fabulous. Thanks. Hi Bill, it has been a while since I participated but this article recalled a similar impression i had moving from the Coastal Redwoods to the Great Basin ecosystems. The Coast having big rain (100 inches plus), big rivers, big trees, big interactions; the GB having small rain (10 inch minus), small streams, small trees, small interactions (seemingly). It took be a while to realize that the difference was a matter of scale rather than complexity. I found the desert communities to be much more finely tuned and much more easily disrupted requiring much longer time to recover. It wasn’t until I got down on my hands and knees that I discovered the microcosmic analogy of the Sword Fern or Oxalis communities that I was so familiar with. I haven’t been to the even harsher Bristle Cone environment, other than seen from a distance, but it would be interesting to compare someday. Thanks for the article. Hi George: Thanks for the comment. I made the correction you requested. Your comment about the difference being a matter of scale rather than complexity is very thought provoking. It would be interesting to find a way to measure those differences.